Sandy Schackman exhibiting for Deep Blue at the Hilton Hotels All Suites Conference in New Orleans. New Orleans, January 9, 2018 – Deep Blue Communications was recently a proud exhibitor at the Hilton Hotels All Suites Conference in New Orleans. Executive VP of Sales – Sandy Schackman – met with Hilton Hotel owners and managers to explain how Deep Blue is able to meet and exceed all technical requirements of the Hilton Hotels StayConnected Wi-Fi program. 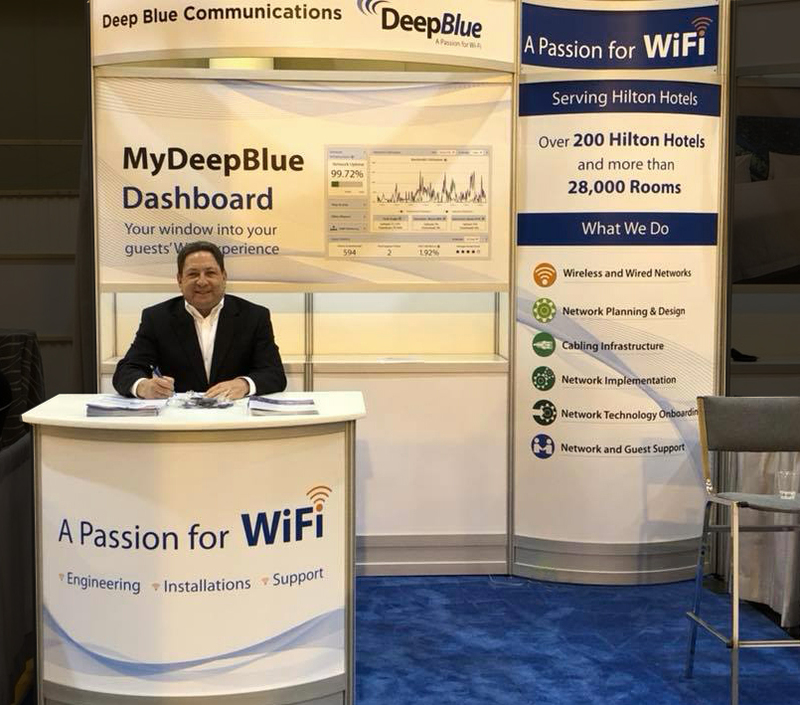 As an approved StayConnected Wi-Fi vendor, Deep Blue provides managed Wi-Fi and network services for over 200 Hilton Hotels and more than 28,000 Hilton Hotel rooms. Our engineers create Wi-Fi networks that meet and exceed Hilton Hotel’s stringent StayConnected requirements for guest connectivity. Deep Blue has the distinction of being one of speediest installers of Wi-Fi networks and technology in the business. Our installation technicians arrive on time, ready to install networks. We strive to achieve little to no disruption to a guest’s stay. Installation impact on your business is kept low too. Also, great care is taken to preserve the integrity of a hotel’s décor during the installation process. Deep Blue also provides 24/7/365 guest support from its U.S. based Wi-Fi help desk located in Latham, NY. Dedicated Hilton support numbers provide immediate contact with our support team. Our tiered support system enables quick escalation, issues are resolved quickly and efficiently. Contact Sandy Schackman today at 1-844-544-3826 to get your quote on a Deep Blue Communications Wi-Fi network for your Hilton Hotels StayConnected program.